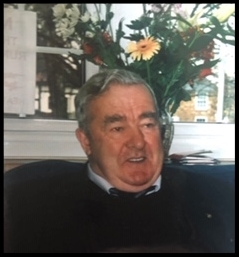 The death has occurred of Seamus Beatty, Corlis, Castlerea, Co. Roscommon. 22nd November 2018. (Peacefully) at his home. Predeceased by his daughters Francie, Rachel and Olive-Nuala and son Eddie. Seamus will be sadly missed by his loving wife Mary, children Gerry, Mary, Jimmy, Cathy, Evelyn and Liam, sisters Francis and Evelyn, daughters-in-law, sons-in-law, grandchildren, great-grandchildren, nieces, nephews, cousins, relatives and friends. Seamus will repose at Gaynor's funeral home, The Square, Castlerea from 5pm on Sunday evening with removal at 7:30pm to St. Patrick's Church Castlerea. Mass of the resurrection at 11am on Monday with burial afterwards to Baslick cemetery, (via Corlis). Family flowers only, donations if desired to Cancer Care West c/o Gaynors Funeral Directors. Thank you for your message. We will pass along your condolences to Seamus’ family in the coming days.